Concept: In the far future, humans have colonized a distant planet called Arieka. On the planet of Arieka, humans and other exotic extraterrestrials co-exist with the indigenous Ariekei. The Ariekei are bizarre looking creatures with two wings, many hairy legs and two mouths which they use together to speak. The language of the Ariekei, simply called Language is unique in many ways and comprises speech units that are like two words spoken at once, one with each mouth. For humans, say red and it’s the reh and the eh and the duh combined, those phonemes in context, that communicate the colour. That is not how it is for the Ariekei. The sounds aren't where the meaning lives. Language is organised noise, like all of ours are, but for them each word is a funnel. Where to us each word means something, to the Hosts, each is an opening. A door, through which the thought of that referent, the thought itself that reached for that word, can be seen. For the Ariekei, a word that is not meant is only noise. So anything that is unknown to the Ariekei cannot be said, because it cannot be meant. With their perfectly referential language, the Ariekei cannot lie, or even speculate. The closest they can come to making allusions is by inducting humans into Language to function as rhetorical devices: making them undergo bizarre ordeals to turn them into human similes that then become part of Language. Lying is a thrill to the Ariekei, who compete at Festivals of Lies to see who can most closely approximate speaking an untruth, an act which is considered impossible and also, highly taboo. Embassytown describes a revolution. It's the story of Avice Brenner Cho, a human simile, who is "the girl who was hurt in the dark and ate what was given her." It is the story of how the simile turns into a metaphor. Of how the Ariekei learn to symbolise, how the Ariekei learn to write, and how they learn to lie. It is a political fable about the power of words. Embassytown is sort of an evolutionary story, as the Ariekei go from being vessels of their language to creatures who possess the capacity of self-aware expression. Does lying make us human? A strangely fitting detail in the book is that it is when the Ariekei learn to lie that they learn to write, scratching primitive marks on the ground, even as Avice pictures them soon holding pens in their giftwings. It begs the question - when did humans go from describing what they saw to predicting what they didn't or couldn't actually witness? It is fascinating that once the Ariekei understand lies, they can no longer tell the truth like they used to. It changes their perspective of the world, of language, and in a biblical fashion, there appears a shift in their understanding of right and wrong. Embassytown puts forth the most obvious and difficult questions of truth and morality. What, really, is left of the meaning of the word truth without the concept of a lie. On weird fiction: Apparently Mieville insists on his writing being labelled as weird fiction. That brings to mind Lovecraft, above all others. Weird is a genre I associate, on an instinct, with fantasy. Kraken would fit that description, it was a strange book that I never particularly enjoyed. 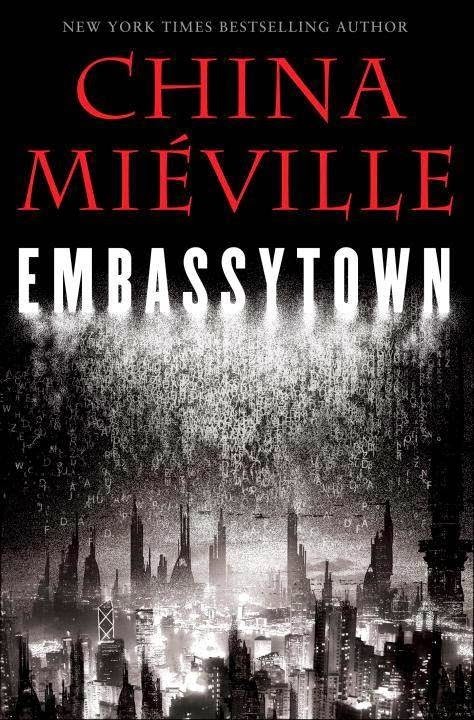 Embassytown, if I had to, I would say, is classic old-fashioned science fiction; even though I haven't read enough sci-fi to make that distinction, I have an intuition about this, it has a feel. A linguistics thriller, I saw it called somewhere - what a delicious description. One of my pet words on this blog is genre-defying. Embassytown, rather, is genre-defining, I'd say, a highly recommended read for those of us who love earnest stories that take themselves seriously. On book reviews: Every once in a while I come across a book that leaves me breathless, heady, asking questions, wanting more. It is at times like these that a part of me is thankful for places like Goodreads and blogs, where I find other passionate responses to stories and get to share mine. A part of me is also anxious, this is the part that has to summon all my thoughts to one place, organize and flesh them out with coherence before committing words to post. Surely I couldn't possibly do justice to a great book and I'm wary of the idea of me commenting as if an expert on a work of genius. And then I remind myself that Tabula Rasa is a book review blog only for the convenience of the term, when actually it is a book appreciation blog. Thus reassured, I proceed to gush, and swoon, and rant, and end up with posts, like this, that are typically disorganized but on the whole, heartfelt. It is two weeks into February and the blog desperately needs to be fed. It also happens to be Valentine's Day, so I'm going to seize the moment and write a post about one of my favourite literary love stories. I have never been much fond of the romance novel. I like subtle romance weaved into fiction of other genres more than books solely dedicated to it. I think I read Possession two years ago and every part of me knows I'll appreciate it so much more today. I read some of my favourite sections of the book yesterday, and they sufficed to make me swoon and want to gush about it. If I had to describe this book in one word, I'd call it dazzling. Possession is the story of two literary academicians uncovering a secret affair between a couple of Victorian poets. 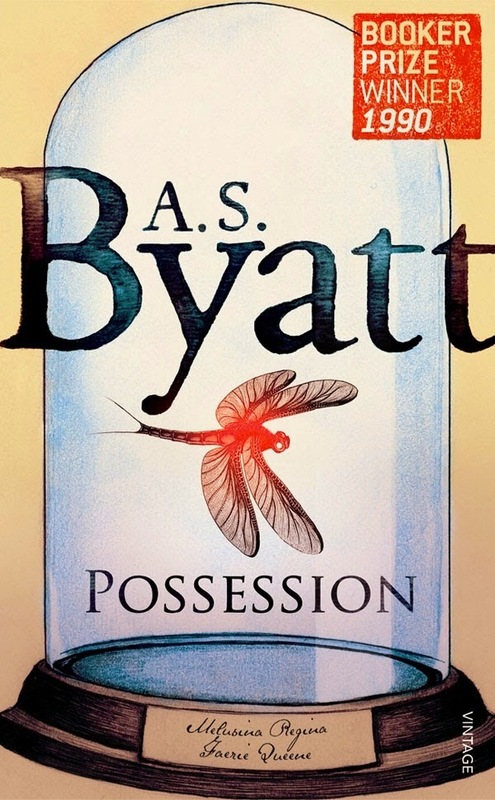 Byatt has woven an intricate love story between the poets, Randolph Henry Ash and Christabel LaMotte, which gradually unfolds through surviving letters, allusions in their works to each other, and the undying memories of times spent together. Meanwhile, in the present, we see the cold distant Maud Bailey immersed in a fairytale romance that brings her closer to her fellow scholar, Roland Mitchell. The book has a lot to say about identity, by looking at the intangible self in a relationship. LaMotte is like the moth forever in a jar, forever helplessly owned by circumstance, and beautiful Maud fights every instinct to let her guard down, almost throttled by the fear of becoming someone's possession. For Ash who may perhaps have failed his lover, Roland finds redemption. On the surface, Possession is a tragic romance, but in its glinting moments, it is a wise and hopeful rumination on relationships. The book is about more than the lovers; etching a quiet romance between a poet and his art, the academician and his scholarship, and a delicate love affair between the past and the present. The style of this book is breathtaking and the pages ooze literary charm. Byatt is smart and she knows how to trap the reader in her magic. A word I find apt for her writing is thick, for being laden with meaning, perhaps. Possession is not a book you can read at one go, you have to slowly swim through it, there are moments when it's almost a struggle and yet mysteriously, not a word seems superfluous. Which is one love story you think everyone must read? And if you've read this book, I'd love to know what you make of it. Happy Valentine's Day, and of course, happy reading!